A safety device for use in the comb part of an escalator landing is operable to detect objects which pass into the comb from the escalator treads. 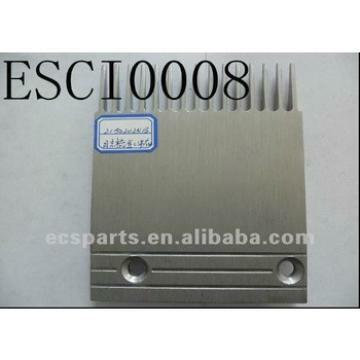 The device includes a photodetector which is positioned beneath the comb and which detects a light beam projected across the comb where the treads pass through the comb. When a foreign object passes under the comb and blocks the light beam, this potential hazard is sensed by the detector. If the light beam remains blocked for a predetermined time period, the detector energizes and amplifier which in turn causes a relay to stop operation of the escalator motor. We are looking forward to your E-mail and establishing cooperative relationship! 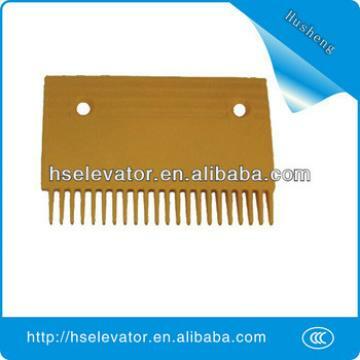 We would provide professional Escalator Comb Platewith good services for you!